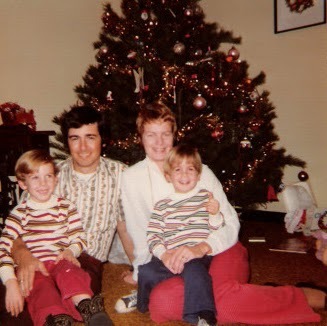 Christmas, 1974, in South Bend, Indiana. Dad, mom, me (front left) and Gregg. 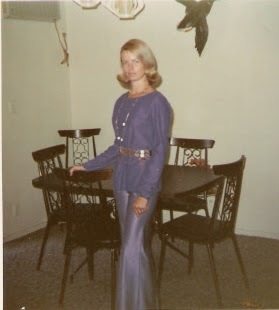 The 70’s were not a stylish time in Indiana. 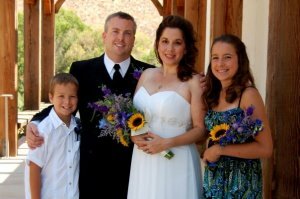 And how fortunate are we today to have instant digital cameras that immediately let you know the picture is off center and you need to re-take it? 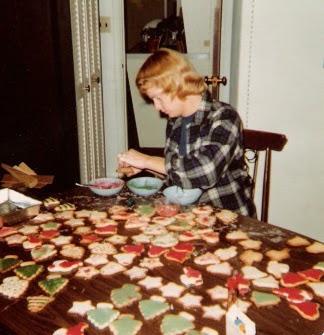 Growing up, my mom, brother and I always made iced pretzels and decorated sugar cookies to give as gifts to our friends and neighbors. Iced pretzels were quite easy (see our recipe at our food blog The Taste Place), but the Christmas cookies were a major production. In fact, I think my mom started doing the iced pretzels to take up space on the gift plates so we wouldn’t have to make as many cookies! Maybe some day we’ll post the recipe we used for the sugar cookies, but you had to set aside at least one full day, if not parts of two. We would make the dough, and then had to let it rest for at least an hour, to let it get solid and easier to handle. Then came rolling them out on the floured table, and pressing with the cookie cutters. We had Christmas trees, reindeer, Santa, stockings, bells, stars, and candy canes, and each batch of dough was like doing a jigsaw puzzle as we tried to make the various shapes fit in together as closely as possible to leave as little excess dough in between as we could. Once the dough cut-outs were lifted out and put on greased cookie sheets and put in the oven, you would re-roll the excess dough (at least the excess dough that Gregg and I didn’t pop into our mouths when mom wasn’t looking) and do it again. This part could take several hours, as we would do somewhere around a hundred altogether. If we did this on a Saturday afternoon, then Saturday after dinner would be the decorating. Or if we did it Saturday night, we’d decorate Sunday after church. This was the most fun part. We would make a simple icing with powdered sugar, milk, and food coloring, and always had white, red, green, and yellow bowls to use. Then we also had red and green colored sugars, cinnamon red hots, and sometimes the multi-colored sprinkle balls to further decorate with. We always started out working on every cookie like a piece of art, painstakingly icing each one, using multiple colors of icing on a single cookie, and drawing designs on them using toothpicks like a fine tipped paintbrush for accents on Santa’s clothing or the stockings, or the reindeer’s facial features. But after the first few dozen, things tended to get sloppy as the novelty wore off and the latter cookies tended to be mono-chromatic with a random shake or two of sprinkles on it. Mom working on the cookie decorating. We’d then deliver our plates of cookies and pretzels door to door to some of our closer neighbors, and I know my mom took them to her Bible Study friends as well. I did the decorated cookies with the kids for years, but more recently with Colleen we’ve done the less labor intensive, but still very pleasing other treats to give to friends–peppermint bark, Missouri cookies, bourbon pecans, peanut brittle, and, of course, my mom’s easy iced pretzels!